With analytical cycles 10 to 50 times faster than traditional gas chromatography, the Teledyne-Falcon GC vastly increases responsiveness for the data consumer. Less time spent waiting on results means more productivity and timely control of the measured process. In the hands of lab and process managers, the speed of the Teledyne-Falcon GC can translate into better quality products, produced faster and more profitably than ever before. 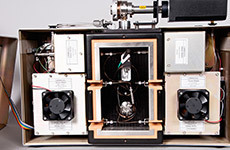 Elimination of the air bath column ovens, required for traditional gas chromatography drastically reduces the Teledyne-Falcon Gas Chromatograph footprint. Yet, the Teledyne-Falcon GC delivers all the functionality of the much larger, high thermal mass, traditional GCs. At less than 25 pounds, Teledyne-Falcon GC offers advanced analytical chemistry in a highly compact and transportable package. The smaller size of the Teledyne-Falcon GC means more efficient utilization of space and, ultimately, bigger profits for the user. The price per square foot for laboratory bench top space may only be exceeded by the cost of installation for online systems in the processing plant. The small Teledyne-Falcon GC footprint allows for higher installation density in the laboratory and in shelters for process applications. This small footprint also enables process installation schemes that place the analyzer much closer to its sampling point in the plant. Closer proximity means less sample lag time, as well as more representative measurements for process control. Using modern computing with standard operating systems and software, the automated Teledyne-Falcon GC frees valuable technical resources from the daily grind of interpreting and validating chromatographic results. Built-in LineUpTM technology from Infometrix, Inc. virtually eliminates misidentification of components and drastically reduces the need for expensive calibration sample runs. Less time spent calibrating the analyzer means more time spent on more economically valuable diagnostics, most notably measured process deviations from the setpoint. Patented, plug and play temperature-programmed gas chromatography column modules allow the Teledyne-Falcon GC to avoid the complicated and troublesome valve schemes used in isothermal process analyzers and many lab gas chromatographs. Correlation between laboratory systems and online process control systems becomes realistically possible with the Teledyne-Falcon GC, because both physical packages use the same measurement principle, hardware and methodology. Applying the Teledyne-Falcon GC in-lab and online means less time spent reconciling lab and process measurements and validating which result is correct. 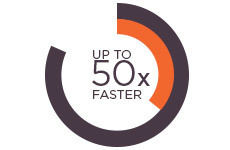 More time can be spent working on more valuable, direct process optimization. The obvious and extraordinary features and benefits of the Teledyne-Falcon GC combine to yield something that may not be that evident: Green Process Analytical Chemistry. The Teledyne-Falcon GC is greener – whether in the control laboratory, online in the processing plant, near line in the pilot plant or when transported for field measurements. 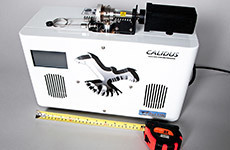 Consuming less than 300 Watts in operation, the Teledyne-Falcon GC uses a small fraction of the traditional gas chromatograph consumption rate of up to 3000 Watts. With analytical cycles that are a minimum of 10 times faster and the low electrical load needed for operation, the Teledyne-Falcon GC power consumption per analysis is 1% or less of the energy required by traditional gas chromatography. Combine these savings with the reduction in workload for air conditioning systems and the Teledyne-Falcon solution is greener still. The Teledyne-Falcon GC product life cycle environmental impact from manufacturing throughout its useful lifetime to disposal is far less than traditional GCs. Faster, Smaller, Smarter, Easier and Greener = better quality, increased productivity, profitability and versatility, with far less hassle and environmental impact. That summarizes the successful, business application equation for the Teledyne-Falcon GC.